Choose a Group topic that has an Engineering focus. GrabCAD Groups is an engineering-focused forum, so Group requests with topics that are unrelated to 3D Printing, CAD design, or engineering in general will be rejected. Make sure that your Group topic is not so broad that it loses focus, but also not so specific as to attract too few members. A subject that’s too broad can lead to a group without cohesive focus. A subject that’s too narrow makes it hard to find members and that leads to fewer discussions and activity. Consider the value that your Group might provide to the members of the Community. You want to suggest groups that will be popular with our members, and focused on topics that provide grounds for lively discussion. Example: “CAD Software Users” would obviously be too broad of a focus, as most of us use some sort of CAD development software! “Solidworks 2017 Users” might be too narrow, because we have members who all use different versions of Solidworks. 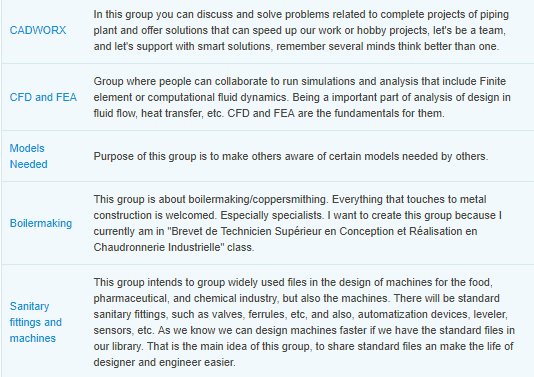 A “Solidworks Users” group is just about right. It makes sure the topic is specific, but also leaves room for all the Solidworks users in the Community. See below for another example: "NEW PRODUCT DEVELOPMENT" is far too broad a focus, while "Car and plane body shape" is too specific. Make sure your Group topic isn’t covered by an existing group. Begin by searching for keywords related to your topic in the Groups search bar. If your topic is already covered, join that existing group instead and start your own discussion there. Example: Say you want to create a group based on Honda vehicles. If you search and there is already a Honda group, please join that group. If there is one on “automobiles” in general, but not a specific group on Honda vehicles, we would suggest that you join the automobiles group and create a new discussion focused on Honda. Be certain that you are prepared to serve as the Administrator for this group. You will be in charge of maintaining the quality of content in your Group, as well as reporting any offenses or violations of the Community Values & Guidelines. You will be expected to help your Group thrive by driving conversation with new discussions, to keep the members engaged. If your group is set to invite-only, you will be in charge of accepting or rejecting requests to join your group. If you are not prepared to take on the responsibility of Group Administrator, but you still want to see a new group created, you should reach out to other Community members who are interested in the same topics as you, and have one of them request to create the group. A group with a great focus still means little without an excellent Administrator leading the way! Write a detailed description with guidelines and add an attractive image that would make it easier for others to find your group. When GrabCAD chooses which groups to approve or deny, the content of your proposal goes a long way. So treat it like a sales pitch! When submitting a request to create a new group, it’s your job as the perspective Group Administrator to craft a clear and concise mission statement that explains the goals of the group, and to establish the rules that your group’s members will be expected to follow. When choosing a group image, think of something that represents the focus and the mission statement, but something simple too that can still be clearly seen if the icon is small. Making sure the image is attention-grabbing wouldn’t hurt either! All GrabCAD Group proposals must include a translation of the 'Description' in English. If you have suggestions or ideas how to improve Groups or any other GrabCAD functionality, join the GrabCAD Community group.